Missouri hurler Steve Powers pitched well in this March 1987 game and the hitters behind him hit well, too. Powers, a freshman at the school, struck out 15 batters and didn't give up a run, The Associated Press wrote. The hitters behind him made it look easy, making the final score 13-0. Powers went on to play the full four years for the Missouri Tigers and pitched well enough for a pro career. His pro career lasted four seasons. He never made AA. 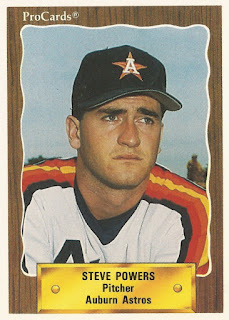 Powers' career began in 1990, signed by the Astros as an undrafted free agent out of Missouri. At Missouri, Powers combined with another pitcher to throw a two-hitter in a Tigers win. With the Astros, Powers played his first year at short-season Auburn. He got into 16 outings, starting five. He went 0-5, with a 6.06 ERA. He moved to single-A Asheville for 1991. he went 8-9 there, with a 4.36 ERA over 36 outings, 15 starts. He gave up a hit in 1.2 innings in a May game. Powers played 1992 at single-A Burlington. Used exclusively in a relief role there, he got into 55 games and had a 4.18 ERA. His final season came in 1993 at high-A Osceola. He went six innings and gave up four earned in an August loss. Overall, he went 4-8, with a 4.32 ERA over 36 outings, 11 starts, ending his career.